It feels good to be writing for Lightspeed again! I didn’t read as many books as I wanted back in 2016, so I plan to remedy this in 2017 by writing this column and sharing all the yummy books I’ve devoured. 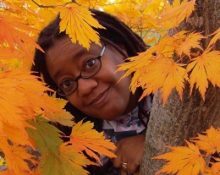 This month, I will review Six Wakes by Mur Lafferty, The Stars are Legion by Kameron Hurley, and A Taste of Honey by Kai Ashante Wilson. 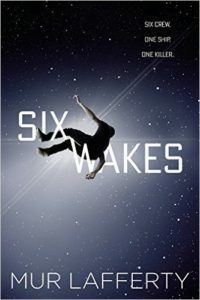 Six Wakes, written by Mur Lafferty, is a whodunit murder mystery aboard a starship. Maria Arena, a sixth-generation clone, awakens in a new body and is treated to the sight of her previous body floating before her, dead. As she wakes up the rest of the six-person crew, it is evident that all of their previous selves have been murdered. Furthermore, their spaceship, the Dormire, a colony ship which is to take them and their sleeping human cargo to develop a new world, is now off course, and the AI running the ship has been hacked. As Maria and the others try to piece together what happened, we go into their backstories and learn that they are connected to each other more than they realize. Suspicion and tensions rise as their pasts are exposed, entangling their present and threatening their future. Reading this is like a mash-up of The Thing and Clue. Lafferty does a good job of creating an atmosphere of tension and paranoia as the crew tries to figure out who the murderer is. I also liked how different pieces of the crew’s past fit together, even if it did feel a little too convenient in places. The Dormire’s crew is delightfully diverse. Maria and the pilot, Hiro Sato share most of the storyline, though we also see point of views from rest of the crew: the paranoid captain, Katrina de la Cruz; the perpetually angry second-in-command, Wolfgang; the doctor, Joanna Glass; and the neurotic engineer, Paul Seurat. As we learn their backstories, we learn that all of them, even the AI, hide secrets, which are slowly exposed over the course of the book. Indeed, all of the crew are tied together, mostly due to their criminal aspect, and as the crew delves further into own pasts, they learn things about themselves that are startling and unsavory. Everything is tied to the mysterious benefactor of their ship and its mission, Sallie Mignon, who we only see in flashbacks. Out of everyone, she was the only person I couldn’t get a handle on, mostly because we only see her from the point of view of the others. On the one hand, I liked that, but on the other, it was hard to read her motives. Lafferty wrestled with issues related to the nature of cloning, the lives of the cloned crew, and the politics behind them. There is some infodumping, but I found it fascinating; she could easily write two or three books based on the ethics of cloning. That said, I found the ending a little too neat, and ethically troubling, in light of all the focus that is put on clones and humans being treated well. But for a quick read, this book shines best when focusing on its mystery and thriller aspect. Like Six Wakes, this story also starts with a woman waking up and learning she is a clone. Zan is the only surviving member of a force sent to the Mokshi, a world-ship that has broken free of the cluster of world-ships called the Legion. Zan has entered the Mokshi before—many times, in fact. But she doesn’t know why she is continually the only survivor, nor does she have any memories of her previous lives. I don’t know if this is the right book to start with if you have never read Hurley’s works before, but wow, this book is amazing. Hurley has created an all-woman space opera, and it’s not for the squeamish. There is blood and tissue and sweat and gore galore. Computers made of flesh. Multi-headed witches who prophesy and compute. The smell of coppery blood everywhere. The women who inhabit the world-ships eat each other to survive. They take cubes of flesh as payment. They recycle dead bodies for food. And they become pregnant and give birth to things the world-ships need: cogs, parts, even other world-ships. Giving birth to actual children is rare. The world-ships are just as surreal: ships that are as huge as worlds, disturbingly organic, made of flesh, skin, and bone. They are also dying, riddled with cancerous tumors. The key to saving them is located on the Mokshi, which only Zan can reach, if she could only remember how. The only person who could help recover those memories is Jayd, who claims to be Zan’s sister, but harbors a passion more characteristic of a lover. Jayd does indeed have all the answers, but she doesn’t share her plans with Zan or the reader. She keeps Zan in the dark of her own past. Out of necessity? Or is it because if Zan knows her own past, it will destroy everything? Who has it worse: Zan who is forced to rediscover how terrible she was by bits and pieces, or Jayd, who knows everything but has to bear the burden alone? And then there is Rasida, the leader of the world-ship Bhavaja, who proves that an enemy intertwined with desire makes for the worst ally. 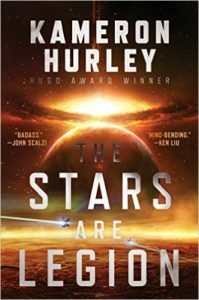 For the most part, though, Hurley’s imagery is breathtaking and ruthless as Zan fights to break free of old cycles and forge new, unseen paths. Rebirth and recycling indeed. I would not be surprised if this book wins many awards in 2017. This space opera will remain with you for a long, long time. And trust me, you will never look at pregnancy the same way again. If I’m going to talk about this book, let’s start with the cover, because oh, what a gorgeous, gorgeous cover! Artist Tommy Arnold did a fantastic job in capturing Aqib bmg Sadiqi, the son of the Master of Beasts, lanky and lion-haired, looking up apprehensively at a storm-filled sky as he strolls barefoot next to his cheetah and Daluçun soldier, Lucrio. 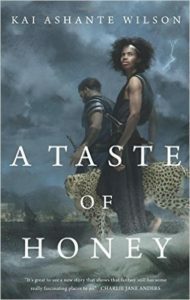 It’s not often that black male protagonists are on fantasy covers. A Taste of Honey is even more notable in that it is also a queer male protagonist, and the story is just as gorgeous as the cover. The story is told in nonlinear fashion, bouncing between the eleven days Aqib and Lucrio have together, along with the days and years where Aqib lives with the consequences of his decision. Aqib lives in a world where an effete man such as himself is always considered a boy, never a true man. When Lucrio challenges that view, it has far-reaching consequences for Aqib. In a sense, the whole novella is about regret, choices never taken, dealing with the loss and the beauty of what should have been. This also applies to Lucretia, Aqib’s daughter, who was my favorite character of the whole book. The ending caught me by surprise at first, but made me reflect further on the nature of happiness. Does Aqib deserve happiness with his lover, or should he live a quieter life as the father to a dynamic daughter? I don’t know if Wilson truly gives an answer to this question. In the meantime, I’m going to read The Sorcerer of the Wildeeps and hope that Wilson writes an alternate story starring Lucretia. As much as I liked Aqib, she deserves her own book.